Motorola's Droid RAZR MAXX builds on the foundation set by the original RAZR and makes a wide number of improvements to an already good design. Here's Phone Scoop's full review of the RAZR MAXX. Motorola took the Droid RAZR and slapped a whopping 3300mAh battery inside and called it the RAZR MAXX. This Android phone for Verizon not only remains thin, but goes and goes and goes like the Energizer Bunny. If you need an attractive, powerful smartphone that will last all day long on Verizon's LTE 4G network, the Droid RAZR MAXX could be the Droid you're looking for. Motorola has a couple of new LTE Droids here at CES. The Droid 4 brings the original Droid series in the 4G era. 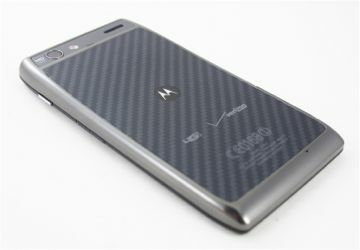 Motorola and Verizon Wireless today announced the Droid RAZR, a new Android-based smartphone that revives Motorola's iconic branding. It has a stainless steel core, Kevlar back, Gorilla Glass front, and Splashguard nanotech coatings both inside and out. Our hands-on first impressions of the new Motorola Droid RAZR for Verizon Wireless. This super-thin phone sports 4G LTE and a super-thin 7.1mm body. Motorola resurrects its iconic brand and hopes to bring back the glory days with the Droid RAZR. This 4G smartphone for Verizon is thin, powerful, and full of surprises. Perhaps it'll be bumped back up with an update?